Over the years, most of the fiberglass statues (which weighed over 1000 lbs.) deteriorated and were destroyed, so there aren’t too many still in existence today. 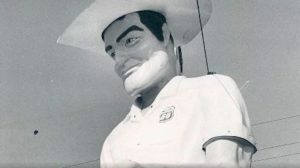 The Inside Scoop’s Muffler Man foundation started out in the 1960’s in Calgary, Canada at a gas station. In 2017, he was discovered in a Canadian junk yard and was completely destroyed. The broken pieces of the 20’ tall statue were taken to a fiberglass expert in Virginia who cobbled them together and made a mold of the assembled statue. That mold was then used to form Chip, the Inside Scoop’s giant ice cream scooper. 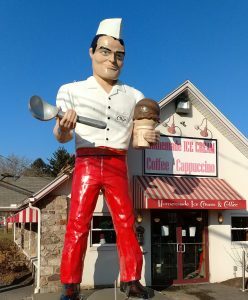 Chip plans on living in Coopersburg, PA at the Inside Scoop for a long time.